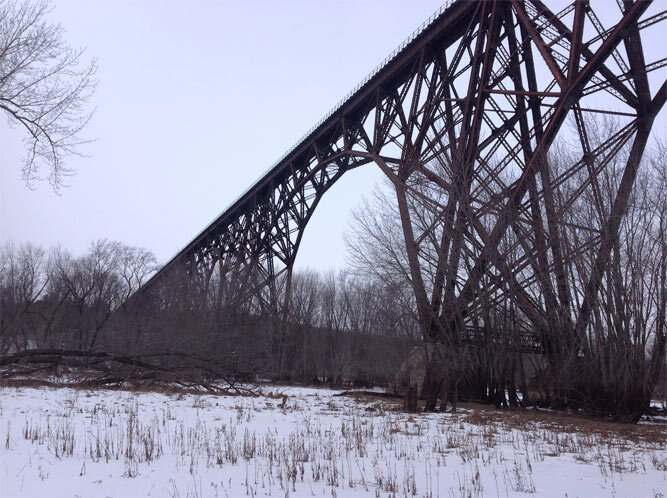 Canadian National Railway retained Fickett to perform an inspection on the Minneapolis Subdivision 493 MP 424.25; Arcola High Bridge over the St. Croix River near Somerset, WI. The inspection was considered a “measured” (in-depth) inspection. Following CN standards, a measured inspection includes detailed measurements of all defects and section loss. 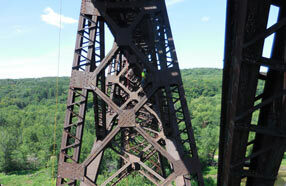 The Arcola High Bridge was built in 1909 and is approximately 2,680 ft. long. The Main Span section consists of five deck-arch truss spans, each 350 ft. long. 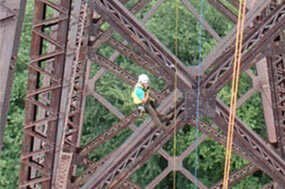 Our team performed a rope access inspection on all portions of the bridge below the bottom flange of the main girders following SPRAT Standards. Ultrasonic testing of pin assemblies was also performed. The bridge approach span piers were accessed from the ground while five main deck-arch truss spans were accessed from the top of the deck. 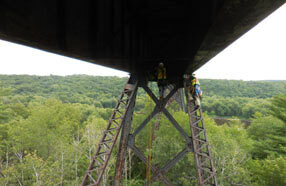 The Fickett inspection team coordinated with CN flaggers prior to arriving on site in order to foul the tracks and access the bridge deck. Prior to arriving on-site, our inspection team converted the plans to an editable PDF format for ease of use during inspection. Tablets were used to record and review all inspection notes and photographs. Fickett created a short hand note taking system that streamlined the inspection process and facilitated a cleaner report writing process. After each day of inspection, the Team Leader would read through all of the inspection notes to ensure that all previous findings were addressed and all areas were inspected. After the inspection was completed, all notes were placed on the drafting inspection sheets in AutoCAD to give CN a visual representation of deficiencies on the bridge. A final report, including a summary of findings, evaluation, and recommendations were submitted to CN.